The temple town of Madurai is one of the most ancient heritage sites of India truly reflective of the cultural ethos of India. Madurai is closely associated with the literary wealth of Classical and Modern Tamil. The crowning glory of this historic city is the sprawling Meenakshi Sundareswarar temple. Four of the 6 major streams of the indigenous system of beliefs as codified by Sankaracharya (i.e. Saivism, Shaktism, Vaishnavism and the worship of Skanda) meet in this historic city during festive occasions when the entire region is transformed into a vast space of celebration. The ancient city of Madurai is second to none in truly representing the cultural traditions of India. Madurai is centered around the Meenakshi Sundareswarar temple. The Meenakshi Sundareswarar temple is literally a splendid art gallery with each stone, each image breathing the tradition of this ancient - and vibrant culture. Legends: Explore legends tracing the origin of the Sundareswarar shrine at the Meenakshi Sundareswarar temple. Legends: Explore legends tracing the origin of the ancient city of Madurai. Legends: Explore legends surrounding Meenakshi (Parvati) and the celestial marriage - Meenakshi Kalyanam with Sundareswarar. Legends: The Tiruvilayaadal Puraanam describes in poetry several of the legends related to Sundareswarar and Meenakshi in the Madurai region. History: Although razed to the ground, the Madurai Meenakshi Sundareswarar temple was rebuilt with amazing resilience by the Nayak rulers of Madurai. Architecture: The vast temple complex is surrounded by fortified walls pierced with towering gopurams seen from a great distance. Sculpture: The sculptural wealth of the Madurai Meenakshi temple is breathtaking. Mention must be made of the columns lining the 1000 pillared hall. 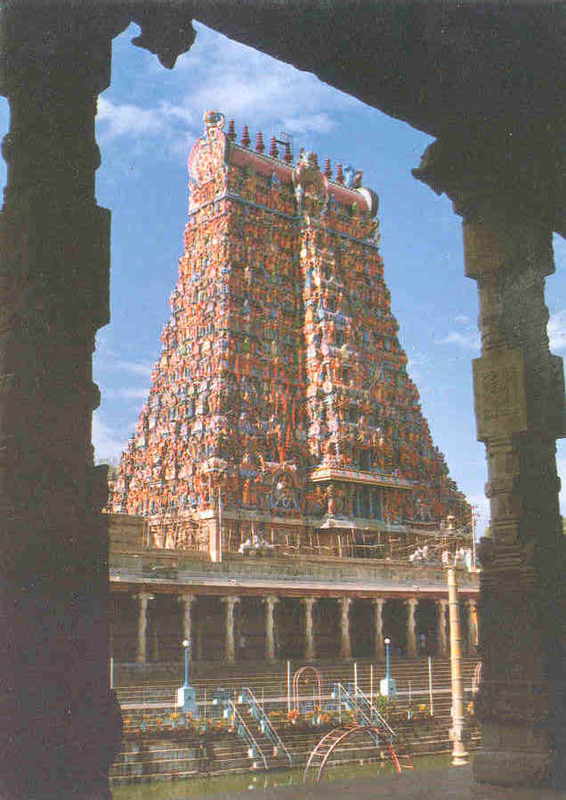 Festivals: The Chittirai Tiruvizha at the Madurai temple attracts hundreds of thousands. It features spectacular processions and an enactment of Meenakshi Kalyanam. Festivals: Several festivals are celebrated throughout the year at Madurai, and many of them involve the enactment of legends surrounding the Madurai temple. The Nataraja shrine at Madurai is referred to as Rajata Sabha, where Shiva is depicted dancing with a raised right foot. Tiruvaadavoor near Madurai represents the birthplace of Maanikkavaacakar the Saivite Saint Poet of the 1st millennium CE. Explore legends surrounding Maanikkavaacakar's life and the Tiruvilaiyaadal Puraanam associated with Madurai. 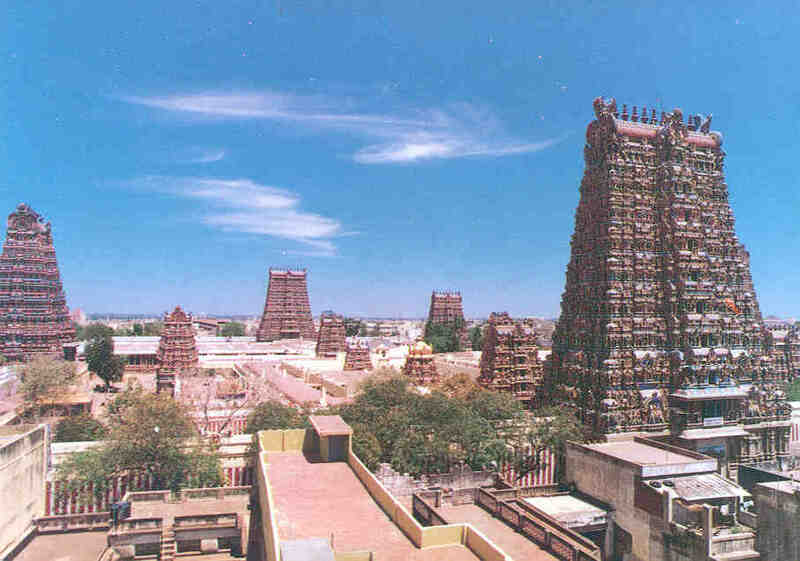 The Kallazhagar temple in the outskirts of Madurai is one of the 108 Divya Desams of the Sree Vaishnava tradition. An image of Azhagar is brought to the vicinity of Madurai during the Chittirai Tiruvizha with great fanfare. The ancient Tirupparamkunram temple enshrining Subramanya is one of the 6 Aarupadai Veedu shrines of Skanda. Festival traditions involve interaction between this temple and the Meenakshi Sundareswarar temple. Also located in Madurai is the lesser known Shivastalam of Tiru Aappanoor enshrining Aappudaiyaar. Located in the vicinity of Madurai and Kallazhagar Koyil is Pazhamudirsolai, one of the 6 Aarupadai Veedu shrines of Skanda. Also located in Madurai is the Koodal Azhagar temple regarded as one of the 108 Divya Desam shrines venerated by the Sree Vaishnava tradition.